One of my new favorite crafts lately has been embroidery. My sister is expecting her first in a little under a month, and I've been enjoying making her some handmade gifts! She's going for an orange/owl theme so I made her owl lanterns for her baby shower, an owl mobile for the nursery (tutorial and pictures coming soon! 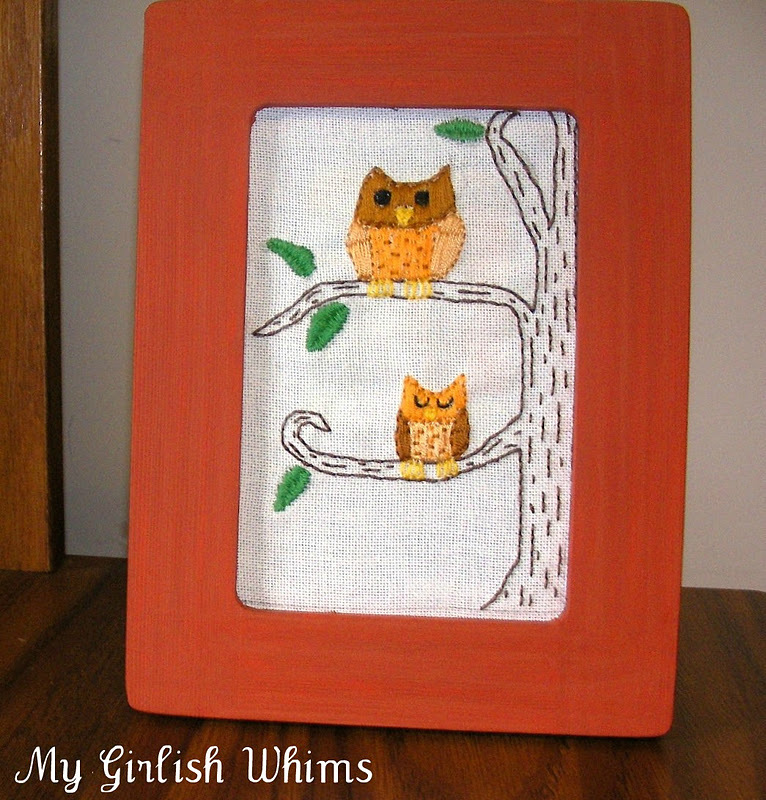 ), and recently finished this cute owl embroidery for the nursery! And here's the big guy! My favorite part is the speckled belly. No clue if owls actually have speckled bellies in real life....but I thought it would be cute haha. All done embroidering....time for a frame. I bought a $1 wood frame from Michaels and painted it orange. And then just wrapped the embroidery around the paper insert that came in the frame with some tape. Super professional, I know. Hey, it will be on the back. No one will even see! And then tada! Cute owl embroidery :) Hopefully it will look good in the nursery!! So cute! I've tried embroidery to make pendants for jewelry, but it's never turned out well. You've got a lot of skill and patience! so cute!!!! You did a great job! You are so crafty!! I love it. i just started embroidering... this is super cute! This is so cute!! Love the owls!! Adorable. I'm with you, embroidery takes way too long. Thank you for linking up to More the Merrier Mondays. So sweet! I love the idea of an owl themed nursery. That turned out really cute! Good job! Hi! Stopping by its fun to craft! This came out great. I love owls :) I would love for you to share this at my friday link party! I love embroidery and owls! Great combo. Would you like to post a photo link to your blog on my Sew & Tell Saturday linky party at my blog this Saturday? Its geared specifically for sewing projects ! Justine @ Sew Country Chick. So sweet... maybe I can tackle this one too. I am crazy for owls lately! Super cute! Thanks for linking up with us and hope you join us again this Wednesday! Have a happy Thanksgiving! I love this design, it's so cute! You're right about how long embroidery takes haha, I've started to use sewing machines and embroidery machines recently which I got from www.sewingmakesmehappy.com it's much quicker and just as fun!